Dear brothers and sisters, […] today’s Gospel passage presents Peter, under divine inspiration, expressing his own firm faith in Jesus as the Son of God and the promised Messiah. 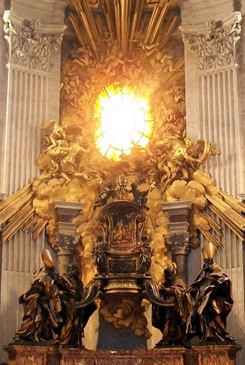 In response to this transparent profession of faith, which Peter makes in the name of the other Apostles as well, Christ reveals to him the mission he intends to entrust to him, namely that of being the “rock,” the visible foundation on which the entire spiritual edifice of the Church is built (cf. Mt 16:16-19). This new name of “rock” is not a reference to Peter’s personal character, but can be understood only on the basis of a deeper aspect, a mystery: through the office that Jesus confers upon him, Simon Peter will become something that, in terms of “flesh and blood”, he is not. The exegete Joachim Jeremias has shown that in the background, the symbolic language of “holy rock” is present. In this regard, it is helpful to consider a rabbinic text which states: “The Lord said, ‘How can I create the world, when these godless men will rise up in revolt against me?’ But when God saw that Abraham was to be born, he said, ‘Look, I have found a rock on which I can build and establish the world.’ Therefore he called Abraham a rock.” The prophet Isaiah makes reference to this when he calls upon the people to “look to the rock from which you were hewn … look to Abraham your father” (51:1-2). On account of his faith, Abraham, the father of believers, is seen as the rock that supports creation. Simon, the first to profess faith in Jesus as the Christ and the first witness of the resurrection, now, on the basis of his renewed faith, becomes the rock that is to prevail against the destructive forces of evil. But the words of Saint Ignatius have another much more concrete implication: the word “charity”, in fact, was also used by the early Church to indicate the Eucharist. The Eucharist is the “Sacramentum caritatis Christi”, through which Christ continues to draw us all to himself, as he did when raised up on the Cross (cf. Jn 12:32). Therefore, to “preside in charity” is to draw men and women into a eucharistic embrace – the embrace of Christ – which surpasses every barrier and every division, creating communion from all manner of differences. The Petrine ministry is therefore a primacy of love in the eucharistic sense, that is to say solicitude for the universal communion of the Church in Christ. And the Eucharist is the shape and the measure of this communion, a guarantee that it will remain faithful to the criterion of the tradition of the faith. Originally published and translated at Cheisa. Used by permission. Benedict XVI was elected pope in 2005. Before his elevation, Joseph Cardinal Ratzinger (b. 1927) served as the Prefect of the Congregation for the Doctrine of the Faith during the pontificate of Pope John Paul II. Before his move to Rome, Ratzinger was archbishop of Munich and Freising. He was a professor of theology at several German universities and the author of many books including Introduction to Christianity, Principles of Catholic Theology and God and the World.